On the weekend of May 3-4, 2014, Assumption 3397 distributed “Roses for Life” after all Masses at St. Bridget’s Church. The Roses are an outward sign of our strong Pro-Life commitment. On March 25, Assumption 3397 sponsored a Day of the Unborn Child Prayer Hour at Saint Bridget’s Church. Assumption Council #3397, chartered on January 7, 1951, embodies the Knights of Columbus principles of Charity, Unity, Fraternity, and Patriotism. Meetings are scheduled on the first and third Thursday of the month in the parish hall below St. Bridget's Church in Glassboro, N.J. All Knights in good standing are welcome. 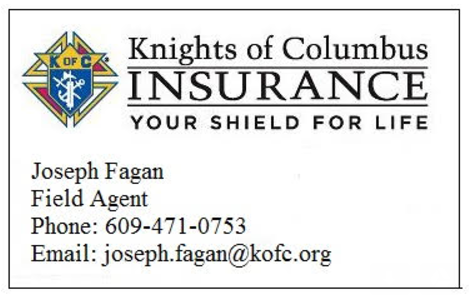 If you are interested in helping those in need, serving your parish, and growing your faith, then the Knights of Columbus is the organization for you. We are a band of brothers, a network of men in communities around the world dedicated to doing good in the service of God and our neighbors. Becoming a Knight of Columbus can transform your life. Membership in the Knights of Columbus is open to men 17 years of age or older who are practical Catholics. Enter your email address to follow 3397 and receive notifications of new posts by email.